December 10, 2016 – It is with tremendous, incredible sorrow that Brandon, Kerri, Tara, and I learned this morning that our website led Dylann Roof to Emanuel AME Church in Charleston, where he shot and killed nine innocent worshipers during a prayer meeting on the night of June 17, 2015. Our hearts were broken by these killings, and after the murders all four of us participated in memorials for the victims alongside our families. My little sister and I took our three daughters to the church to grieve and stand guard during the funeral, when it was expected that white supremacists may attend. We helped form a human chain around the church to try and protect the mourners, and my then 13-year-old niece painted homemade signs to express our love. To discover now, today, in the midst of his trial, that our own work in creating the resource below introduced Dylann Roof to this particular church is devastating. The South Carolina Picture Project exists to honor our state and our history. Photographers and writers from around the world donate their work in an effort to digitally archive sacred South Carolina landmarks. Our goal was to honor Mother Emanuel and her long and beautiful past. We lack the words to express the sadness we feel in knowing that the love we intended contributed instead to hate. To the families of the nine victims who died, we are deeply sorry, and we send our unending love. June 18, 2015 – SCIWAY offers our prayers and heartfelt condolences to the congregation of Emanuel AME Church following the June 17, 2015 fatal shooting of nine church members, including the Reverend Clementa Pinckney. Other members lost in the tragedy were Cynthia Hurd, Susie Jackson, Ethel Lance, the Reverend DePayne Middleton-Doctor, Tywanza Sanders, the Reverend Daniel Simmons, the Reverend Sharonda Coleman-Singleton, and Myra Thompson. The Gothic Revival building that houses Emanuel AME Church in Charleston is a testament to the determination of the church’s founders and its early congregation. 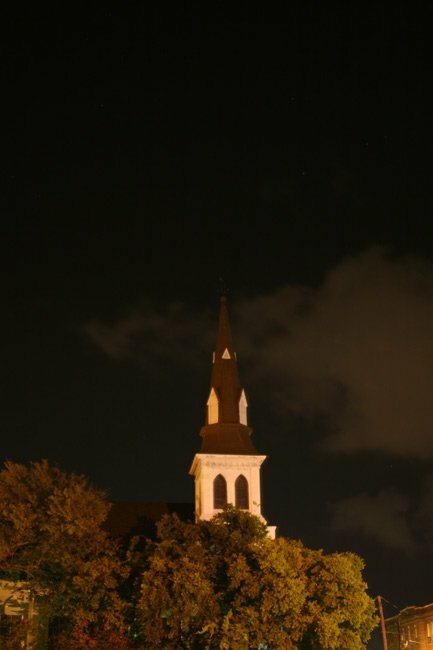 The present-day structure with its signature steeple was built in 1891, replacing an earlier wooden church from 1872 that was damaged in the Charleston Earthquake of 1886. Many of the brick and marble panels were restored between 1949 and 1951. The origin of Emanuel AME dates to 1816, when Morris Brown organized a withdrawal of the Charleston Methodist Episcopal Church’s black members over a burial ground dispute. The newly-formed congregation quickly established themselves as an African Methodist Episcopal church, a denomination that was founded earlier in Philadelphia by the Reverend Richard Allen. The church is the oldest AME church in the South and one of the oldest black congregations south of Baltimore, Maryland. 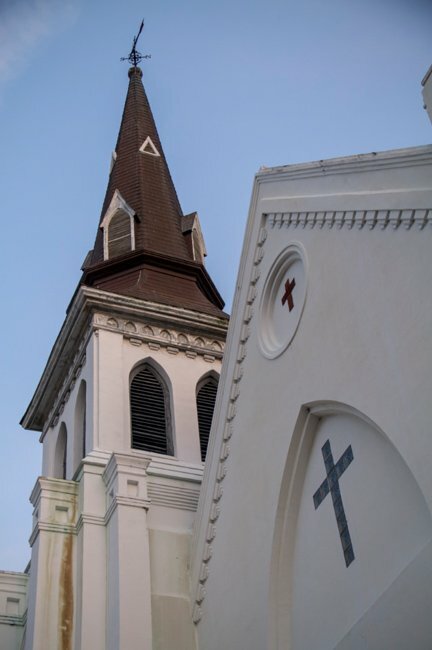 Emanuel AME Church in Charleston has a long history of freedom, slavery, rebellion, and peace. The church began as an outgrowth of the Free African Society, formed in Philadelphia in 1787, and was originally comprised of both slaves and free blacks. In 1816, the year the AME denomination was formed, black members of Charleston’s Methodist Episcopal Church left over a dispute regarding burial grounds and joined the new African Methodist Episcopal (AME) denomination. The new AME church met in the Hampstead suburb (Charleston’s French Quarter) and was known as Bethel because it was one of three AME churches on the Bethel Circuit. The new church was led by Reverend Morris Brown, himself a free black. The church burned in 1822 after a planned slave insurrection known as the Denmark Vesey conspiracy was discovered. The church was the suspected meeting place for the planning of the rebellion. Though Reverend Brown was acquitted of conspiracy in the plot, he nonetheless was forced out of South Carolina. Former slave Denmark Vesey, the conspiracy’s architect, was not as fortunate. He had been a founder and active member of the church and was convicted of using his skills as a religious leader to encourage slaves and free blacks to join the uprising. Vesey was kept in Charleston’s City Jail until he was hanged, along with 36 of his co-conspirators. Though the church rebuilt, it was forced to close in 1834 due to a new law prohibiting any black person – free or enslaved – to worship without the oversight of whites. Fear of future slave revolts had gripped the city, and many residents erected iron spikes along their gates – known as chevaux-de-frise – to prevent rebelling blacks from entering their homes. An example of the ironwork remains at 27 King Street. However, members of the AME church continued to congregate; they met secretly and illegally until the end of the Civil War. 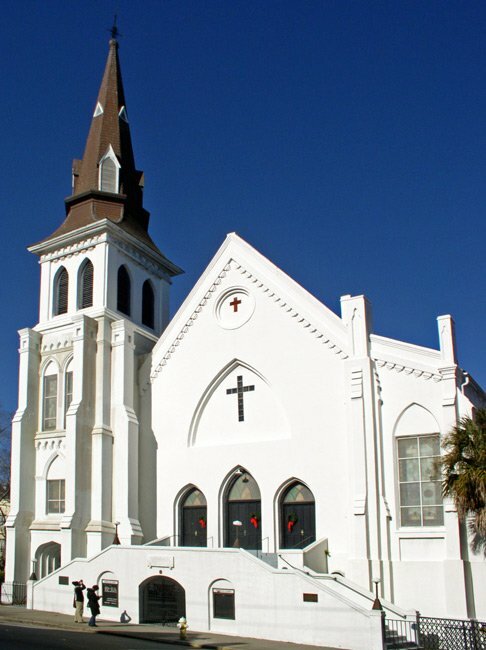 Once blacks were permitted to organize their own churches in 1865, the church was reborn as Emanuel AME Church. The first church under this new name was built in 1872 at the current site, yet was severely marred in the great earthquake of 1886. The present Gothic Revival building replaced the damaged church in 1891 and was restored and stuccoed in 1949. Emanuel AME is known as the oldest AME church in the South. 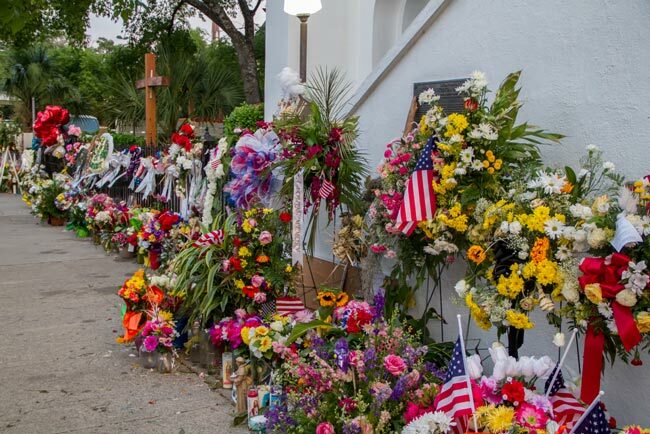 Following the tragic shooting of nine church members – including the church’s minister, the Reverend Clementa Picnkney, also a South Carolina state senator – on June 17, 2015, people from all over the globe have expressed their love, grief, and support by leaving memorials outside of the church. 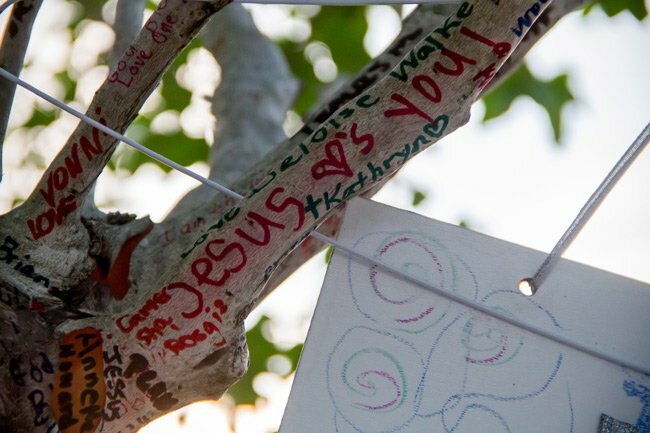 Those who wished to leave thoughts and prayers for others to read simply left messages on a tree outside the church, seen below. Several of the donated objects are in the process of being archived for the church by volunteers from the Charleston Archives, Libraries and Museums Council. Pieces of art, sculpture, flowers, and notes are among the many items given to the church as a sign of support from mourners. Below is an article that was contributed to the South Carolina Picture Project by Bill Segars of Hartsville. It originally appeared in his local paper, The Darlington New & Press. It was published in June of 2015, shortly after the shooting. We mentioned a couple of weeks ago about venturing outside of Darlington County to learn about other church buildings. We did, and it was received very well. I did not plan on going back out again this quickly and certainly not for this reason. But after what happened on Wednesday evening, June 17, 2015, at one of “my friend’s,” I suspended the article that I was preparing on a Darlington County church for this one, a historic pillar of South Carolina culture and religion. This is not the forum to discuss the most unfortunate events of that evening, but it does afford us the opportunity to learn more about Emanuel AME Church in Charleston, and in doing so, to honor the memory of the nine Christians who lost their lives so unnecessarily on that night. In my small way, I would like for my ability to share with others what I’ve learned about this church and its history to honor those who were lost as we ban together and move into the healing process. Emanuel’s history goes back to 1791 when an organized group of free Negroes and slaves banned together under the name of “Free African Society” for the sole purpose of worshiping. It soon became a part of the Methodist religion, on the “Bethel Circuit.” They met in the Amherst and Hanover Streets area of the historic port city, where they owned a “field of graves.” In 1818 a dispute arose over this “field of graves,” and the Reverend Morris Brown pulled his congregation out of the Methodist faith and formed the “Hampstead Free African Church” with about 1,000 members. In 1816 the Reverend Richard Allen formed a new church in Philadelphia, which developed into a new denomination, consisting of free Negroes. The denomination adopted the name of African Methodist Episcopal. It was this group that the Reverend Brown elected to join soon after Hampstead was formed in 1818. A parcel of land was acquired, and a wood frame building was built as the first African Methodist Episcopal congregation in the South. Two years later, the Reverend Brown and other members of the church were arrested and jailed for violating state and local laws, which prohibited religious gatherings of slaves and free blacks without white supervision. Denmark Vesey is a name which is very much associated with the church that we know today as Emanuel AME. Vesey was raised in the Virgin Islands as the personal servant of the slave trader Captain Joseph Vesey. In an attempt to make a new life for himself, Captain Vesey settled in Charleston in 1783. Denmark remained with the Captain until 1799 when he was able to purchase his freedom with his $1,500 winnings from a lottery ticket. With his freedom, Denmark began to establish himself as a successful carpenter, building many houses for other free blacks in the Charleston area. In December of 1821 Demark started organizing a slave rebellion, and when authorities were informed of the plot, 313 alleged participants were arrested, with 35 – including Denmark – being executed. The Reverend Brown, suspected but never convicted of being a part of the plot, was able to leave Charleston and became the second bishop of the AME denomination in Philadelphia. With their leaders gone and their wooden church building burned, the congregation struggled to stay together. But together they stayed to build and worship in another building until 1834 when all all-black churches were outlawed. Even then this strong congregation continued to meet secretly until the end of the War between the States in 1865. At that time the congregation reorganized as a new church under the official name of Emanuel AME, meaning “God with us.” Seven years later the group had acquired land on Boundary Street, now know as Calhoun Street, and built a nice wooden structure. They were off and running at their present location, not to be denied their right to worship again. Even though the church was not to be stopped again, it was not without setbacks. 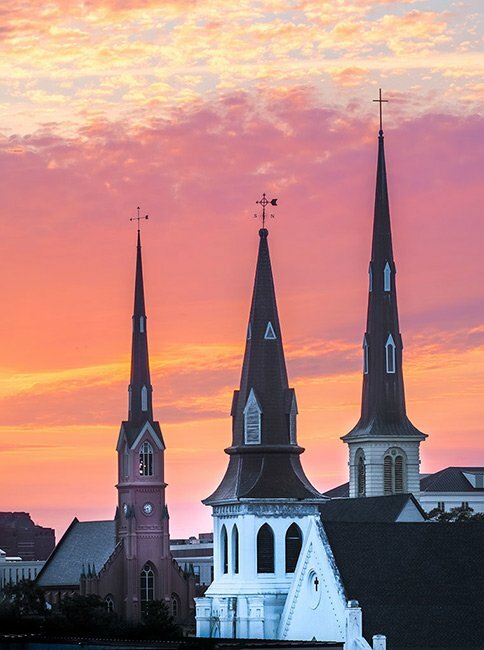 On the evening of August 31, 1886, Charleston was hit by a 7.2 magnitude earthquake, killing 60 people and demolishing many buildings in Charleston, including Emanuel’s wood frame house of worship. As all of Charleston reeled in the massive destruction of their city, Emanuel began to make plans to rebuild. In light of the fact that Emanuel lost so many church buildings previously, the congregation learned it needed to build a stronger and larger building this time, one that would last for a long time. The Reverend L. Ruffin Nichols, pastor at the time, insisted on the Emanuel plan for the future along with the church’s present needs for a building. As soon as the congregation could get its feet back on the ground after the earthquake, it hired noted Charleston architect John Henry Devereux to design a suitable building. Construction began in 1890, and the massive Gothic Revival brick structure was completed in 1891 for a cost of $35,000. The present bell tower, with its octagonal copper-clad steeple, was added in 1903. The interior was outfitted with the present elegant pipe organ in 1908 at a cost of $800. As the congregation continued to grow in numbers and financially, a total renovation of the building was completed in 1951, under the leadership of the Reverend Frank R. Veal. With this work being completed, one would think the building would be set for generations to come; yet, another setback arose. This one was also experienced by all of Charleston, on September 21 through 22, 1989. Most of you remember those dates, but for the few who may not, that was the time of Hurricane Hugo. Need I say more? Emanuel was not destroyed, but it did cost $230,000 to repair it. Do you notice the increasing cost of each renovation or repair to the original $35,000 building? This exemplifies the congregation’s dedication to its heritage. Does the church have a cemetery in Charleston, SC? Hello Marlena! It does our hearts good to know that the message touched you and we want to sincerely thank you for the time it took to let us know. We would be honored to hear more about your project and get the word out via our social media accounts. The tragedy that occurred at your safe place shattered our hearts and we can only imagine what it did to yours. Your congregation’s constant source of peace and forgiveness sent a powerful message to the entire world. Our thoughts and prayers of continued health and prosperity are being sent to each and every one of you! We will be in touch by e-mail to hear more. Thank you! Hello, I am a lifelong member of Emanuel AME Church. Tonight I am searching for information to contribute to a page for a part of our commemoration of the June 17, 2016 tragedy, the lives of those lost, and the survivors. I was very touched by your comment above the information about our church. I want to thank you for taking the time to write that information. I don’t know if anyone from the church has been in contact with you but I would like to be certain to share this page with our pastor and congregants. I appreciate your kind words. As a way to honor those persons who lost their lives, the survivors, their families we have a project called Acts of Amazing Grace. I would be happy to tell you more about that if you are interested. I am available via my email. Thank you again. Hi, Charlotte. You will have to contact the church itself for that information. The website for Emanuel AME is listed above the map. Best of luck! I am from the Saint Nicholas AME Church in Namibia and would also like to express my sincere heart-felt condolences to all involved in this tragedy may you all find comfort in our Holy God Jesus Christ. Wow, thank you for sharing this personal account, Dr. Baker. My family was assisted by this church in 1898 after the lynching of the father, Frazier B. Baker, and his infant daughter in Lake City, SC. The whites in the area were opposed to his appointment by President William H. McKinley as postmaster. The family remained in Charleston for 18 months awaiting trial. Sixteen dollars were collected and given to the widow and five remaining children. I have recently completed a book on this horrible lynching. Many thanks to Emanuel for assisting my family. Kindly accept my deepest heart-felt condolences.God comfort and strengthen the families and friends affected by such occurance. For further consolation and inspiration, access my free download ebook at http://navicy.wix.com/understanding. May their souls and the souls of all who depart with the mercy of Our Lord Jesus Christ, rest in peace. Hi, Arthur. What a kind gesture. I believe your poem will have a better chance of reaching the church if you use the website above the map on this page. Best wishes to you, and thank you for sharing your gifts. You have my heartfelt condolences over the loss of Rev. Pinckney & all members of the congregation. With all that has gone on recently, America & the world needs patron saints Christian Fellowship to show us how to act. And, perhaps that was God’s plan. All of you will remain in our prayers … always. From Charlotte: We’re deeply saddened by such evil, but God will prevail! Our church congregation prayed yesterday for all of you. And what a SHINING example you are for all of us. I’m so proud to say there is a city like yours in our great land. You show what a true Christian spirit should be and your city will be smiled upon by God forever. Our love and hearts to all of you. We in Louisiana are prayer for you, so we love you and God bless you. My prayers go out to the 9 families this morning as I watch the church service on television. May God be closed to all of you as you walk forward on the journey of healing. My heart is full of anguish and I can’t stop crying every time that I see the news about this senseless, horrible, hateful tragedy. I will continually pray for the families, and that this country can get past this hate. We just have to. We all have to work together for this to happen. God bless the families of the victims and the whole Charleston community. My heart breaks and my soul trembled as I watched and listened to the Horrible news of what has happened to your families. With an open heart you welcomed this young man to join as you continued your worship service….I pray comfort and peace to each and every one, God, I pray take you into the embrace of his loving arms…. I hurt inside for all of you at Emmanuel Church. The love and forgiveness that you have shown toward the enemy is a tremendous example of Christ’s love. You’re are myBrothers and Sisters in Christ and so I will keep you in my prayers for strength and comfort. We love you and are praying for you. LOVE ALWAYS WINS!!!!!!!!!!!!!! May the Lord’s love and peace comfort and surround you!!!!!!!!!! My heart goes out to the people and their families. Such a bad thing to happen to good people. Condolences are not enough. I pray that God has blessed them all. Churches are everyone's sanctuary. I pray for everyone to be safe to praise God. Amen. I feel your sorrow and hope that you will heal quickly.My joy would be that each of you will feel the hand of Christ upon your head, and find peace. I would also like to get a recent tape of one of Rev. Pinkney’s sermons. I’m sure I would enjoy it. Let me know the cost and I shall be happy to send it. God Bless & keep you until He comes. Such a senseless tragedy, it saddens me deeply. My prayers and petitions to all who grieve, may God’s comfort pour down a mighty balm on your spirits and may our country stand together, condemning such hatred. This is so horrible, our prayers are being sent to all the families of the victims. you must remember that God has everything in control and this man will be caught and punished. Be Blessed all of you. My prayers goes out to all the families and may God with all His power give spiritual strength during this trying time. Our prayers to the victims, their families and friends. May God help all of us to find the strength and inner peace we will require to heal our hearts. I am so, so very sorry. There are so many prayers coming from my family to yours. It's not much in the scheme of things, but I hope it helps with the healing. My heart cries for your loss. We need to unite with each other at all times against bigotry and ignorant hatred. May the light surround you. May the Lord’s choicest blessings rest upon you and the comforter soothe your hearts. May you know that many people are praying and add their support to your families, churches, communities, and state. Please know that I am among them. We love you dear brothers and sisters. I'm speechless, but prayerful theat God will comfort & strengthen the families & friends affected by this act. PRAY!!!!!! My deepest sorrow, prayers and love to all. I wept this morning when I started to read about this. I pray that the healing power of God over take all the families and friends, that God's love and peace will be with you all. Love and prayers, Thomas Wilson Ordained Minister. I am from Charleston and am so heartbroken to hear about this horrible tragedy and have the victims families in my prayers. I hope the man who did this is caught quickly. Yes, Emanuel A.M.E. Church does have a burial ground; however, it is off site of the church itself. It is located on Lemon Street, near Magnolia Cemetery in the Charleston Neck area. I was wondering if this church has burial grounds. My great-grandparents’ death certificates have Emanuel Ground on them dated 1894 and 1897.